The first Arcadia 85S has been delivered to her American owner just seven months after the hull was sold. The 25.90 metre Arcadia 85S is a special edition of the Arcadia 85 range, featuring a new sky lounge that can be converted into a sheltered third-deck. The windows, which wrap around the whole of the sky lounge, can be closed to meet the hardtop roof and protect against inclement weather, offering panoramic views whatever the forecast. Built in GRP and aluminium by Arcadia Yachts, Arcadia 85S has a maximum speed of 18 knots and a range of 850nm at 12 knots. Francesco Guida completed the naval architecture and interior and exterior design of this semi-displacement superyacht. Designed over two decks as a family yacht, Arcadia 85S has four guest cabins in her lower deck. 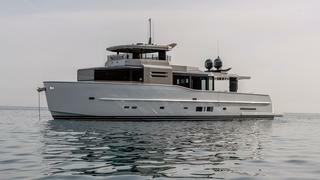 She can accommodate eight in her owner’s cabin, VIP cabin and two twin cabins. The bow offers accommodation for four crew. The interior of Arcadia 85S reflects a simple and understated styling with a blend between indoor and outdoor spaces. With double layered reflecting glass used as the exterior walls of the deckhouse, her interior is bright and airy. The main saloon has space for eight, with a protected area at her aft-deck lounge ideal for dining and plenty of space to sunbathe towards her stern. The Italian yard prides itself on its eco-friendly nature, and with 36 square metres of solar panels fitted, Arcadia 85S is greener than some of its rivals. These solar panels supply up to 3.5kw of energy – enough to power systems such as refrigerators, water circulation, lights, A/V electronics and more, while still charging the superyacht’s batteries. As well as reducing pollution, this naturally reduces the consumption of diesel and adds to the comfort on board since generators aren’t producing noise or vibration as they run.